If you’re looking for a way to keep track of what’s going on with your vehicle this is the way you’re going to do it. 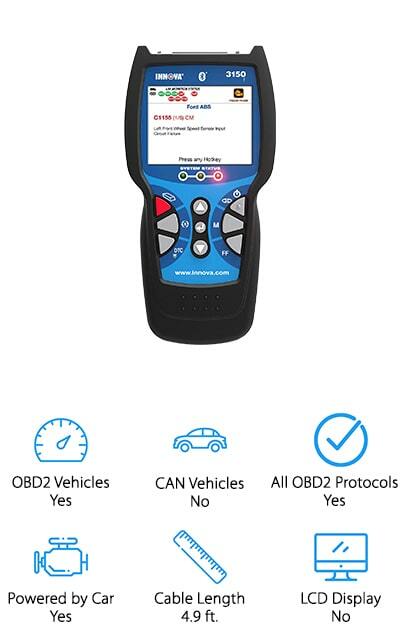 OBD2 scanners are designed to help you better understand your vehicle and the problems that it is experiencing. Where once this was something only mechanics and automotive technicians were able to do, it’s now something anyone can do with the right tools. 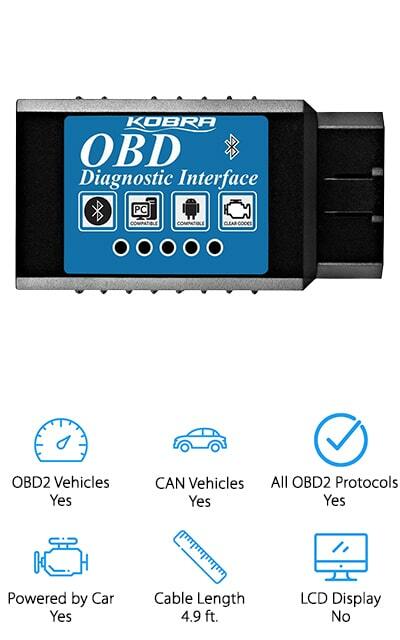 We’ve compiled the best OBD2 scanner reviews to help you decide which ones will work for you. OBD2 Vehicles: Does the scanner you’re looking at work with vehicles that have been sold after 1996? After this year vehicles were required to be OBD2 compliant. At least cars and light trucks were, so take a look here. CAN Vehicles: CAN vehicles are those that use a controller area network. CAN readers are a little different and require a slightly different capability from your vehicle. That’s why you want to take a look at what all it reads. 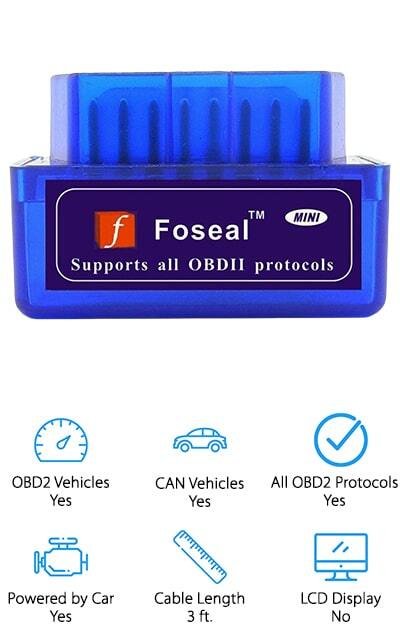 All OBD2 Protocols: Just because most vehicles are required to use OBD2 doesn’t mean they use the same language to do it. This includes ISO9141, KWP2000, J1850 PWM, J1850 VPW and CAN to be complete. Powered by Car: Do you need an external battery of some type in order to keep your scanner running? 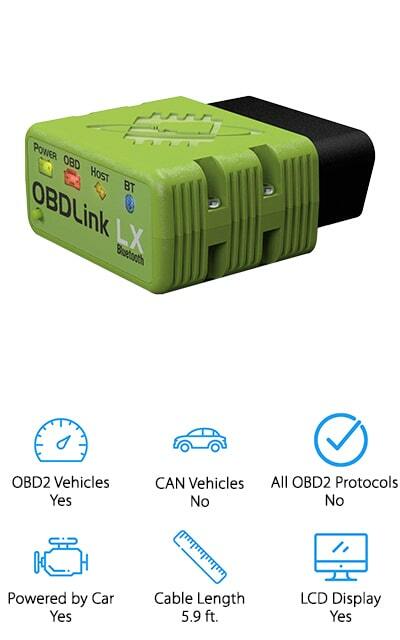 Some do, some are powered directly by the vehicle instead of through a cable called the OBD2 Data Link Connector. Cable Length: Cables are going to connect the scanner to your vehicle, which means they need to be long enough to reach where they need to be but not too long to get in your way. Check this out to be prepared. LCD Display: An LCD display is not a necessity, but it’s definitely something to consider. That’s because it’s easier to read and definitely a higher end product. But again, it’s something that falls more under personal preference. If you’ve never looked into these types of products before you may not even realize that there are so many out there, but there really are. That’s why it’s important to take a look at what we’ve come up with for you. We’ve found the best options currently available and we want to make sure you can choose your favorite. So, take a look at these 10, rather than doing all the research and hard stuff yourself. You’ll be able to get started a lot faster. You want to get the best OBD2 scanner for the money and that means you want to take a closer look at our top pick. 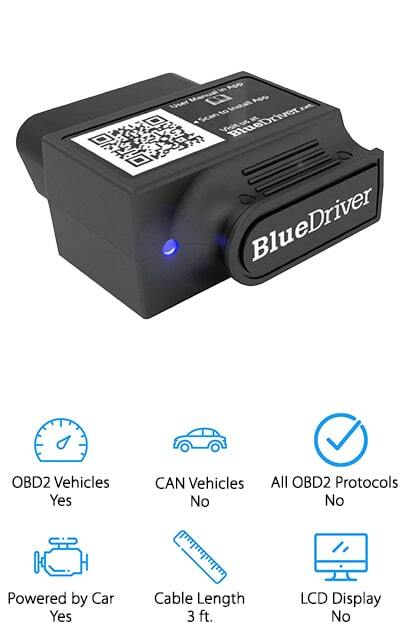 This Bluetooth scanner actually has a handheld system that lets you easily see the results of every engine code that your vehicle gives. It provides you with the ability to not only read the check engine lights and codes but also to clear them. On top of that, you can use it on absolutely any vehicle that’s from 1996 or newer. That means you’re going to have a system that works for any of the vehicles in your household. Because it’s a Bluetooth system it also lets you see the codes directly on your phone or other Bluetooth device and it gives you an app to help you understand how to fix your vehicle. You’ll be able to get everything in English, Spanish or French as well. If you want the best cheap OBD2 scanner then this is one to take a closer look at. It’s inexpensive and connects easily to your vehicle so you can get all the information that you need to keep your car running properly. It works on all vehicles from 1996 or later as well as CAN vehicles that require special connectors. 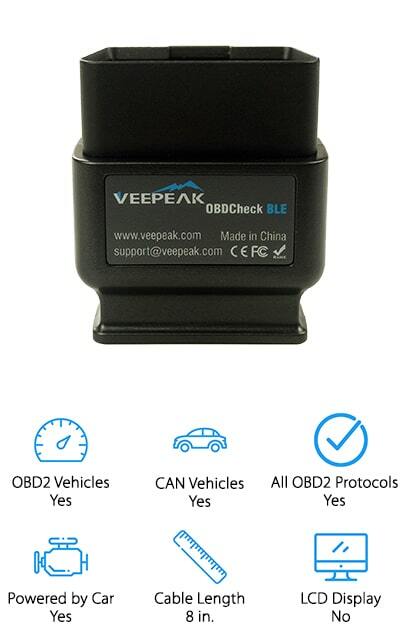 Available in versions to connect with your iOS device or your Android or Windows device, this scanner even allows you to read and clear check engine lights and several different monitors and sensors within the vehicle of your choice. You can trust that this tool is going to work for you because it actually comes with a 2-year warranty. If you ever have a problem you can contact support and make sure you’re ready to go. The tool even comes with compatibility for several different apps to get the most out of it. With this scanner you can connect to any iOS or Android device, so you can read your results quickly and easily. You’ll be able to connect to any device that was produced in 1996 or later and you can get high-quality sensing. There are plenty of apps and updates available to make sure you always get the best capabilities. On top of that, it has vehicle specific repair reports that let you know what your specific vehicle needs to get back to normal. You’ll have interactive graphs, live data and a whole lot more to help you stay aware of what’s happening in your vehicle. With this tool, you can clear out codes and you can even freeze frame vehicle information or check smog tests. You even get advanced test results. Everything here will help you understand your vehicle better and make sure it’s operating the way that it should. This isn’t exactly the best handheld OBD2 scanner, but it is a high-quality tool that you can count on for results. 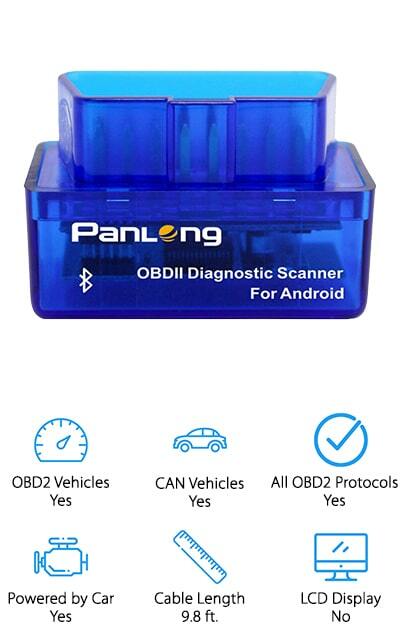 With this scan tool you plug directly into the vehicle and then you can get diagnostic information directly on your Windows PC, laptop or even your Android phone. It’s not designed for use with iOS devices but connects through Bluetooth to several others. You don’t have to worry about hacking because of the design and you get coverage for any vehicle that was produced after 1996. That means you’re getting plenty of versatility. If you decide that you don’t like the device you can even return it for a full refund within 90 days. That means you get plenty of time to try it out and make sure it really does what you want. You’ll also get a 3-year warranty to know that it’s going to continue working great. With this device, you’ll be able to plug directly into your vehicle and get diagnostic information directly on your movie device. Whether you use an Android, Apple or Windows device you can see real-time data and logs with no problem, as well as GPS mapping and more. The high speed of the system and the low power consumption mean that it’s safer for your vehicle and you can easily leave it up and running as long as you want without having to worry about your vehicle battery running low. Designed to work with vehicles built after 1996, it has several compatible apps available. 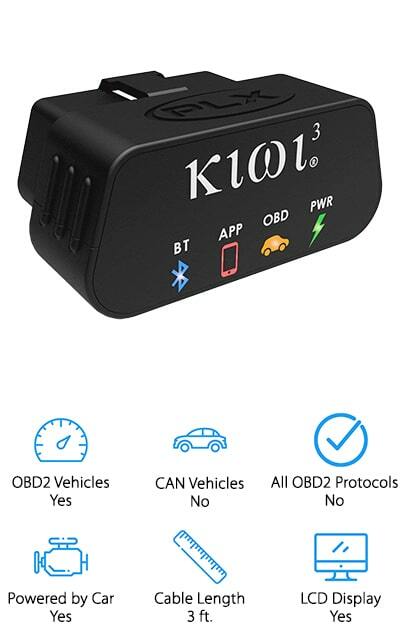 Small and lightweight, this device will connect easily into your vehicle and you won’t even notice that it’s there. The Bluetooth system means that you can check out the information easily on any device and the firmware updates automatically over the Bluetooth connection as well. One of our best OBD2 scanner Bluetooth options is right here, a high-quality tool that plugs directly into your vehicle and gives you a readout on your Android or Windows device. Designed for any vehicle from 1996 or newer, this system even works on CAN vehicles that require specialized equipment and reading. It’s an inexpensive option that you can connect to quickly and easily. Designed to work with a range of different apps, as well as third-party apps, it can read and clear error codes quickly and easily, so you can get back to what you need. Designed for a range of different vehicles, it can make sure you know what’s going on in your vehicle and it can even let you know how to fix some more minor problems. All you need is a device to connect it with for reading. Designed to work with both iOS and Android devices, this Bluetooth optimized scanner is simple to install and provides readings directly on your mobile device. That means you always know what’s going on when your vehicle gives an error code or a light or sensor comes on. It works on all vehicles that are newer than 1996 and it works with a variety of third-party apps, so you can choose one that works best for your vehicle and device and your needs. You can diagnose and even clear different codes as well as resetting different lights on your vehicle. Made for even CAN vehicles, which require specialized equipment, this device gives you a strong connection and a 1-year warranty. Plug one of our best Bluetooth scanner options into your vehicle and you’ll quickly and easily be able to see exactly what’s happening. This plug is small and it’s inexpensive, so you don’t need to worry about picking it up for your vehicle. Designed to work with your Android device, it’s compatible with several different apps so you can easily read the codes that are being given and then clear them. You even get to see sensor lights and a whole lot more. It’s made for vehicles that were made after 1996 and works on nearly all of them. If you’re not happy with it after trying it out you can get a full refund and there’s a full 1-year warranty included on the device itself, in case of any problems. No matter what you’re worried out, this sensor can help you understand your vehicle. Here you’ll find a high-quality scanner to let you know what’s going on with your vehicle at all times. It works well with Android and Windows devices so you can get a full reading while you’re still out and about. Connecting through Bluetooth, this system works on all vehicles that were built after 1996, which means you can use it with several different vehicles. You’ll also be able to check manufacturer specific codes and standard, generic codes, so you’re always prepared for what’s happening. If there’s ever a problem with your vehicle you can even clear codes and lights when you know what’s going on. What’s even better is the purchase itself is completely risk-free. You get a full year money back guarantee, so if you decide that it doesn’t work for you, you can get your money back right away. 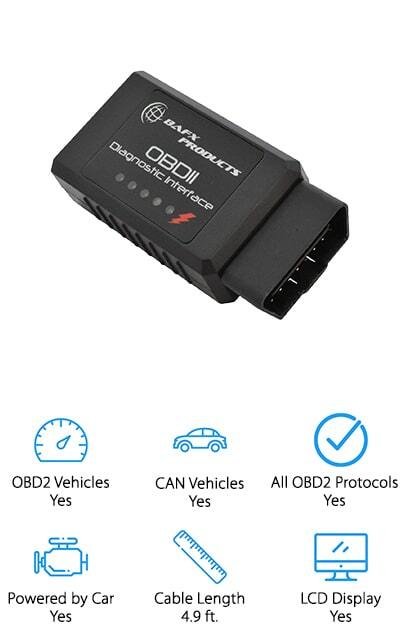 This is one of the best rated OBD2 scanner options available and provides you with a connection to any iOS or Android device. You’ll be able to connect to one of a range of different apps and then you can easily get readings and codes delivered directly to your device. Licensed and certified for both these types of devices, it has a Bluetooth system that allows it to connect and makes sure that it’s portable and transferable. You’ll get vehicle-specific reports if there’s anything wrong with your vehicle, so you can make adjustments or work on repairs for yourself. If you’re looking for a device that works with all OBD2 vehicles, or vehicles built after 1996, you’re in the right place. This system is designed to really get you back on the road again and make sure you know what you’re doing while you get there.